So there we were on Badentarbat Beach, Achiltibuie, 6 novice kayakers keen to get paddling. 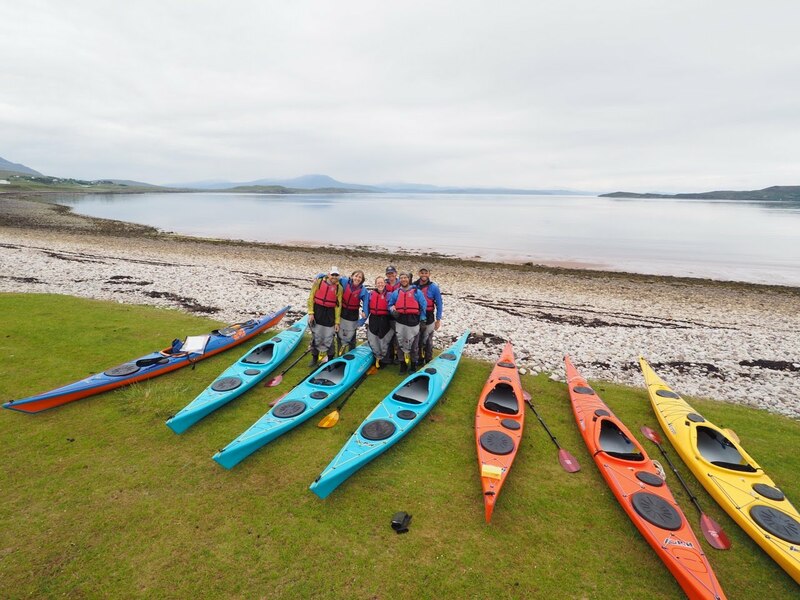 Our guide, Will from Kayak Summer Isles was there with shiny new kayaks and soon got us all geared up. We carried the kayaks down on to the shoreline through a gap in the seaweed Will had thoughtfully cleared for us and headed out on a mirror calm sea. We soon arrived at Isle Ristol, the calm sea and paddling tips making the journey feel quite effortless. After a ‘comfort stop’ (well, the majority of us are now in our 40s!) and a discussion about what we could do next, we headed round the south side of the island and over to Eilean Mullagrach. We were so lucky with the sea conditions as it enabled us not only to paddle all the way around the island (something of a rarity) but also meant we could explore the variety of sea arches and sea caves along the way. What a privilege! Next stop, lunch on Glas-leac Mὸr. The Kelly kettle was lit so we could all have a hot drink with our sandwiches and we sat and watched a porpoise 20m in front of us. Amazing. After lunch, we were given 3 choices of a route back to Badentarbat. Watched once again by a seal we left Glas-leac Mὸr and made a line for a group of islands between Tanera Beag and Tanera Mὸr. Here we were surrounded by jellyfish, giving us the opportunity to learn a bit more about these weird and wonderful creatures. Both me and Rich were now feeling a bit foolish after fleeing from what we now knew were non stinging jellyfish the day before when we were snorkelling. Ah well, every day’s a school day. So, all good things must come to an end and it was time to head back. What a day. Stunning scenery, great company and a great guide. Only one question. When can we do it again? !